Expect the best in Psytrance, Bass, PSydub, Chill, Reggae on a phat 10K soundsytem ! With Fire performances, Art , Kiosks, Yoga , Workshops and more! 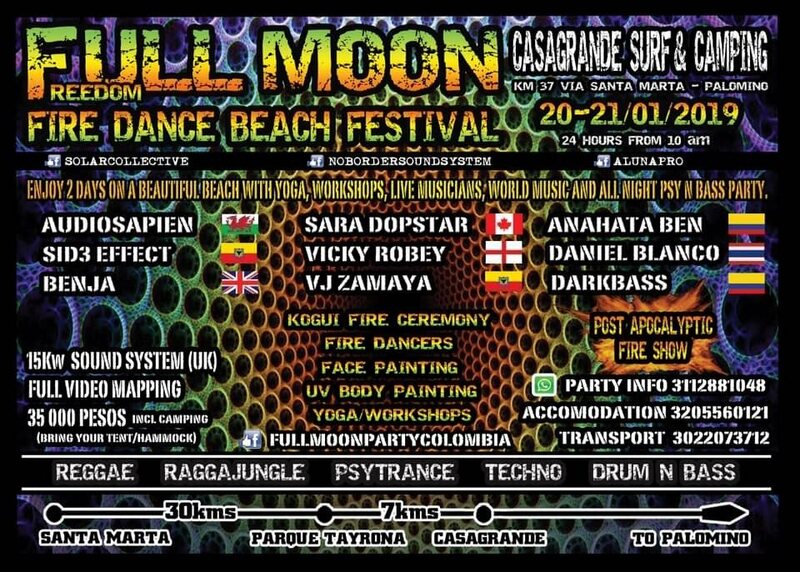 For this edition we have teamed up with Colombian Psytrance crews Aluna-Pro & Solar Colective to bring something a little different for the start of the year full moon celebration ! This is a co-creation benefit event where your talents are always welcomed to share with others while also giving back to the local communities. Wanna do a workshop, sale your crafts or perform ? Great! get in contact with us with your proposal ! Come share your art and contribute to this vision for more amazing events with the psyfamily at the heart of the world, Sierra Nevada de Santa Marta. Come early for workshops and other surprises ! We will be honoring this powerful land that is hosting us and paying respects with a beautiful full moon ceremony guided by a Kogi tribe member while also sharing and enjoying the meaning of life on deeper ways that connect us to our ancestral roots, our higher self, the divine creation flow and the tribal spirits that flow through the land to share the message & vibration. Located on a beautiful private beach with a full bar, restaurant and surfing activities. Where you can camp, rent a hammock or enjoy a cabin for your stay right on the beach. You can come as early as you like to enjoy daytime activities/workshops or go for a swim before the big party starts. You can then stay until 6pm the next day to relax after a good night. If you want to stay longer you are welcomed to book the night(s) at the regular price.